It is difficult to imagine a similar collective action today in a city that, despite a still-beating heart of unionism, is best known as a place where the major local boss, Amazon, diligently staves off worker bargaining via perks including valuable stock and free bananas. So don’t hold your breath, all ye card-carrying members of the proletariat — and ye bean counters who manage them. We’re not likely to be struck by a rerun of the famed General Strike, in which 60,000 workers (including striking shipyard workers), representing all 110 unions of the Seattle Central Labor Council, walked out in proud solidarity, effectively shutting down a city of 315,000 people for nearly six days. 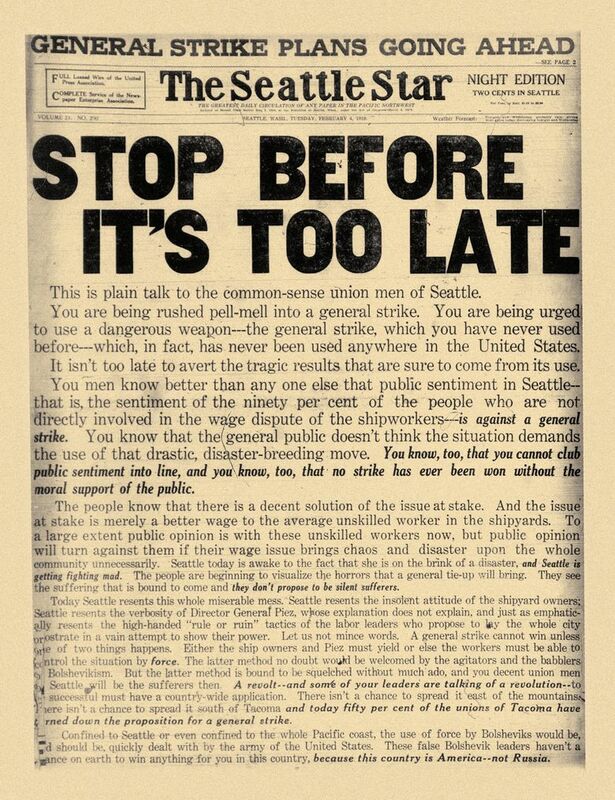 Why, then, 100 years hence, does the legendary Great Seattle Strike of 1919, long considered a quickly fizzling failure, still matter? For one, it launched a year of tumult that many historians identify as the symbolic end of the U.S. “Progressive Era.” For another, its causes, effects and aftermath are useful to evaluate where we were, in contrast with where we are — all part of the ongoing quest to figure out how the heck we got here. Also, this: Because of its symbolic importance, the strike over the past century has taken on mythological dimensions, the result of blurred memories, hasty summaries, forgotten details — and intentional revisionism. Ideologues on both the political left and right have retold the tale of the strike to suit their own purposes — clearheaded context usually not among them. The strike’s centennial provides a good excuse to pick the brains of historians in an attempt to provide context that only the passage of time can deliver. Rather than attempt to retell the entire tale, well-chronicled elsewhere, we’ll look here at the General Strike via a myth/truth methodology, based on readings and interviews with modern historians. Myth: The strike became famous because it was a national first, and established a winning precedent for U.S. labor actions. Truth: Not exactly. Although the “general” (involving all unions in a given place) nature of the strike was unique at the time, other “citywide” strikes had occurred before it. This one collapsed in less than a week, due largely to unexpectedly fierce opposition. It did, however, have other important long-term implications for labor, not all of them as bad as earlier history suggested. Myth: The strike occurred when enough workers in enough industries finally became sufficiently enraged with their own working conditions that they banded together and attempted to shut down the city. 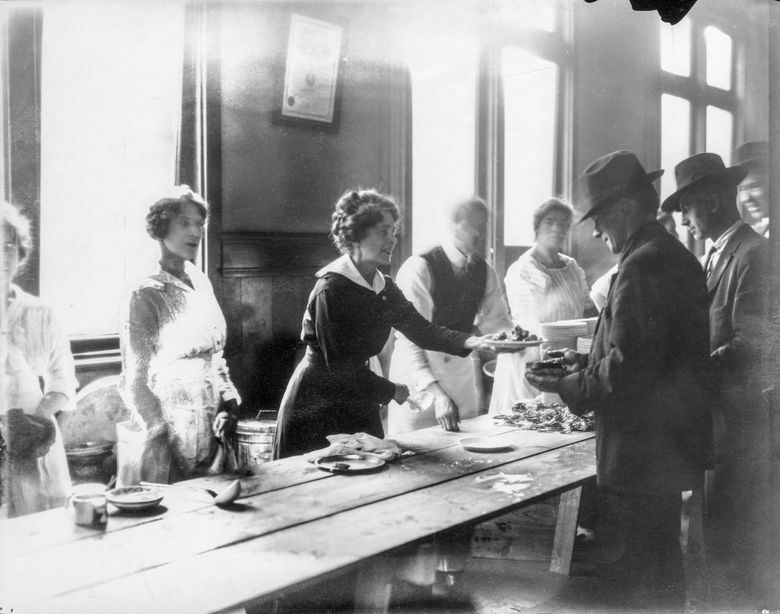 Truth: Strikers shared a degree of common hope for the betterment of all working folks. 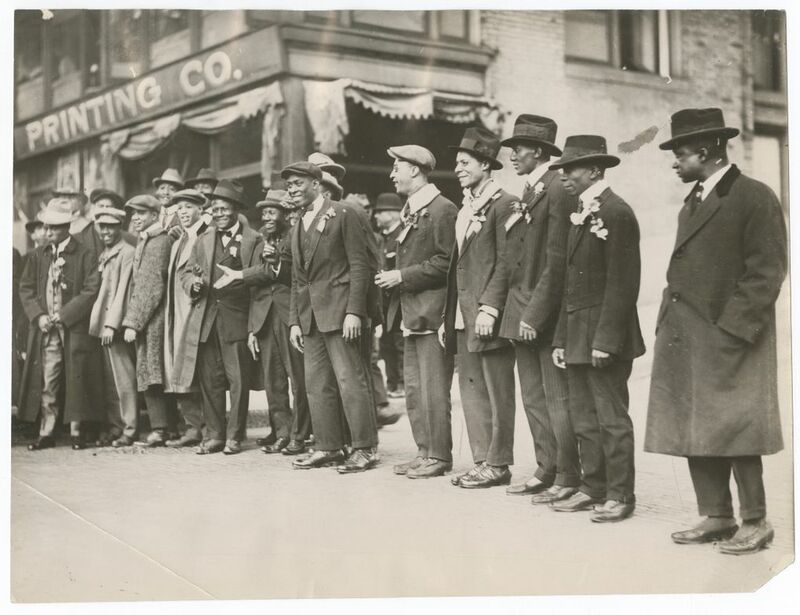 But the action was, at heart, simply a sympathy strike with 35,000 shipyard workers, who were demanding that employers (and the federal government) make good on promises of better wages made throughout World War I. Those goals were not achieved. Myth: The strike was an organizational disaster from Day One, leading to its quick collapse. Truth: The strike actually shines in retrospect in its meticulous planning. Although nearly every business in town was shuttered, the streets largely empty and quiet, store shelves bare from prestrike panic and some rich people’s homes sitting empty as their inhabitants fled the city to avoid rioting rabble, peace and order prevailed. Strike organizers had drawn up plans to ensure most essential civic needs were met. 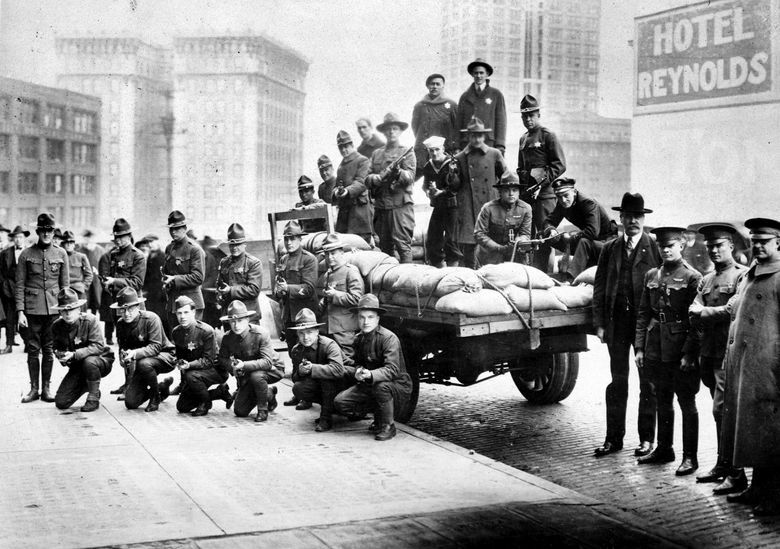 Using union labor, they fed strikers and nonstrikers, delivered essential goods and even helped police the streets. It worked, although maintaining the structure for a longer strike likely would have been challenging. 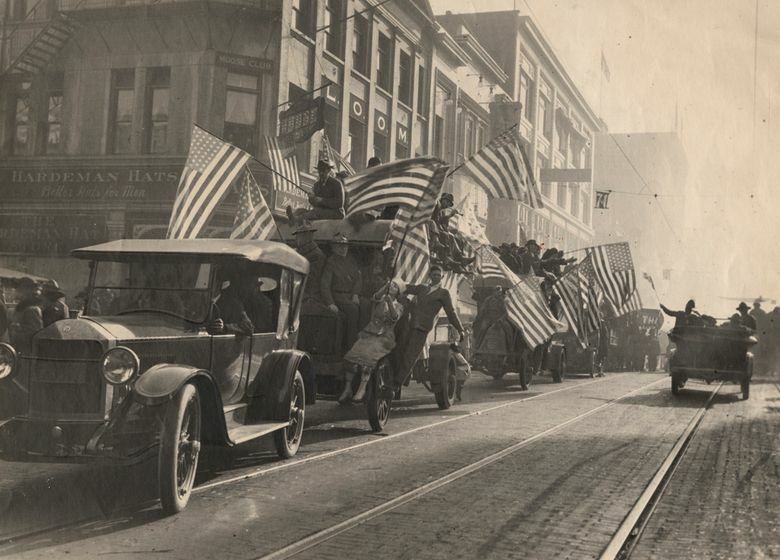 Myth: Though brief, the strike must have been an unprecedented shock to the system of an otherwise-peaceful, post-WWI scene in the bucolic, sleepy, tin-cloth-and-flanneled Pacific Northwest. Truth: Only if one ignores all the other prior and concurrent calamities of the era, which were immense, and mostly owing to the fighting and reverberations of the war. The strike, in fact, likely registered more along the lines of: What else can go wrong? First, the Seattle of the day didn’t exactly fit with most of our backward-gazing vision of a smoky village of wet-wool-wearing Scandinavians carving out a dank existence by felling trees and canning salmon. 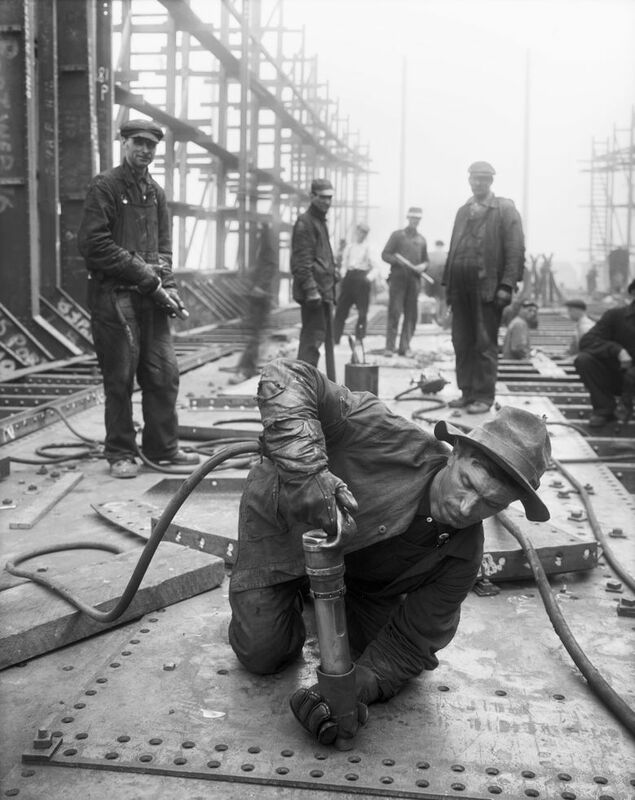 Lucrative wartime government contracts to a dozen local shipyards had made Seattle a boom town — with results that might sound familiar: Tens of thousands of new workers had flooded the city, creating housing shortages, rents generally deemed too damn high, and a sidewalk vibrancy and skittishness frowned upon by the disapproving old guard. 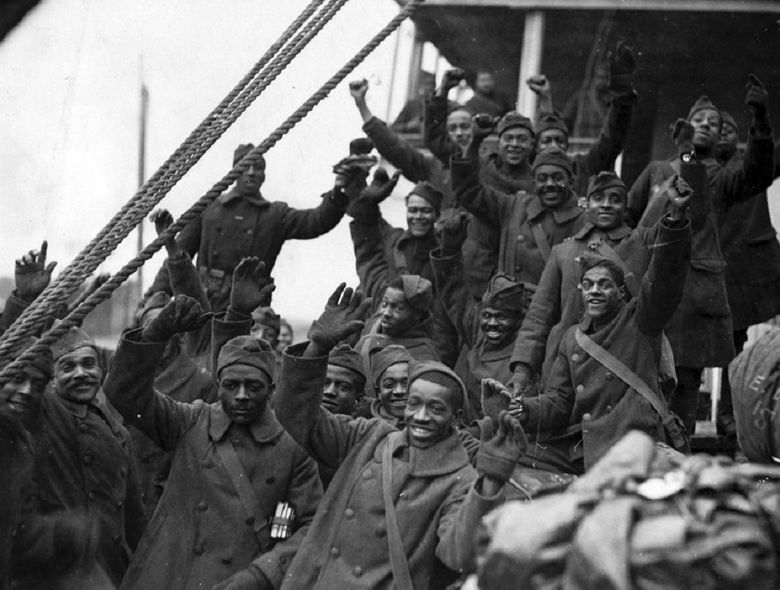 Second, the Great War also had an outsized impact here in other, critical ways. 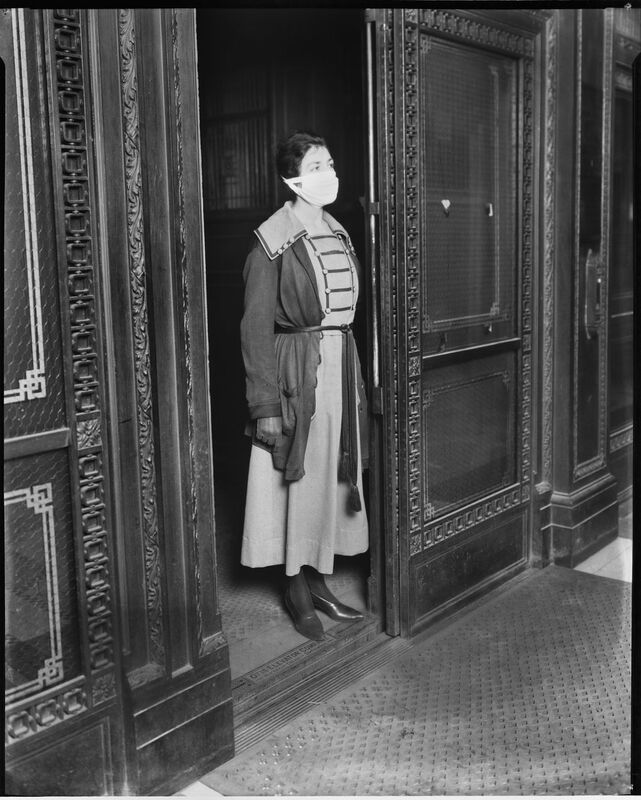 A global Spanish flu epidemic that flourished after the war claimed 650,000 American lives — five times the number of U.S. troops who perished in the war itself. 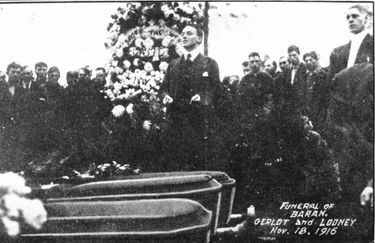 About 1,400 Seattleites died from the disease just in the few months preceding the strike. Everyone knew someone stricken. Third, fears stoked by war had unleashed dark forces of xenophobia and political retribution against leftists, unionists, immigrants (especially anyone with even a trace of German or Austro-Hungarian heritage) and peaceniks of all stripes. German language classes were canceled in local schools; the symphony banished the works of German composer Richard Wagner. 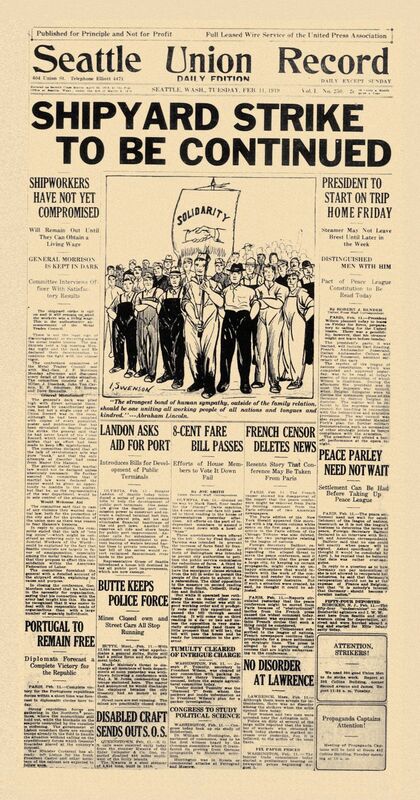 Thanks to new federal legislation outlawing sedition, various Northwest “radicals” had been rounded up during the war and sentenced to federal prison for activities such as handing out literature urging people to become conscientious objectors. 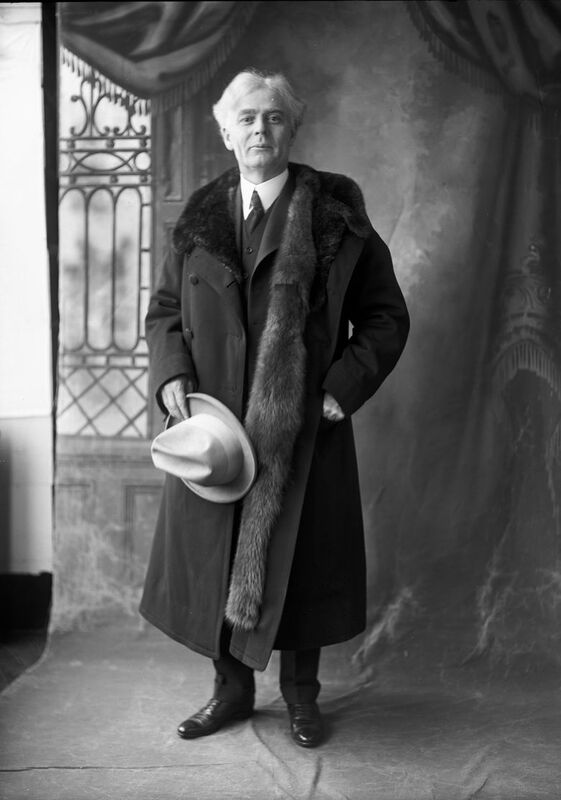 Thus, the General Strike of 1919 is often hailed as the launching point for what historian Robert K. Murray would term the “anti-left hysteria” of the nation’s “first Red Scare” of 1919-21. Passions raised during the strike did not create, but likely helped sustain, this undercurrent of virulent, anti-communist, “pro-American” sentiment that lingered around Puget Sound for decades, creating challenges to academic freedom, suppressing civil liberties, and leading to violent clashes between unionists (particularly revolutionary members of the Industrial Workers of the World, or Wobblies) and right-wing groups and local authorities. Myth: The collapse of the strike on its sixth day, Feb. 11, was historically important in that it nipped a potential Bolshevik-style revolution from starting on the West Coast of the United States and spreading across the country. Truth: Strike motivations were complicated; the failure to acknowledge this has long contributed to the granddaddy of all Seattle Strike myths — the squelched revolution theory. This is owing in no small manner to the post-strike grandstandings of Mayor Hanson, who departed on a national speaking tour and launched a presidential bid by taking credit for strong-arm tactics that he said surely saved the country from its own Bolshevik Revolution. Some context here: Some local union members clearly were inspired by the 1917 Bolshevik Revolution, and would have been happy to hasten a collectivist society. This sentiment spilled over numerous times in local union shops, and was a featured philosophy of the Wobblies, who had been driven largely underground by this time, but had found Seattle as a sort of safe space to function as an unofficial West Coast headquarters. But most local labor leaders, part of the American Federation of Labor umbrella, were not revolutionaries, and the strike was not called to foment revolution. Myth: The legend of “revolution” surrounding the strike was completely orchestrated by right-wing politicians, such as Hanson, seeking to take advantage of the civic upset to promote their anti-communist platforms. Truth: While there’s some truth to this (see above), it’s fair to say the actions of some strike leaders — intentional or accidental — gave the likes of Hanson plenty of “red” meat with which to cook up a (highly effective) conservative backlash. 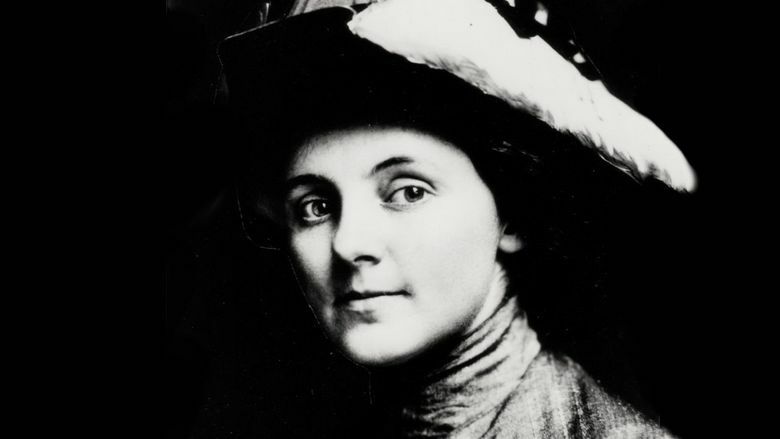 Strong, who along with other strike leaders and Union Record staffers was later arrested under sedition charges (ultimately dismissed), later insisted that the provocative statement was not a call to arms for revolution. Myth: The strike, which led to the summoning of federal troops by virulently anti-union Mayor Hanson, led to inevitable violent clashes between workers and the government. Truth: The opposite is true. In fact, the most remarkable legacy of the Seattle strike, Gregory and others note, is that workers managed to at least partially paralyze an entire U.S. metropolitan area for almost a week, without even a hint of violence. Until the strike, most people assumed any general strike in a U.S. city would ultimately turn bloody, Gregory notes, because most of them had. “Seattle changed that story,” he says. That’s significant, because it reassured other workers around the world considering broad-based strikes. 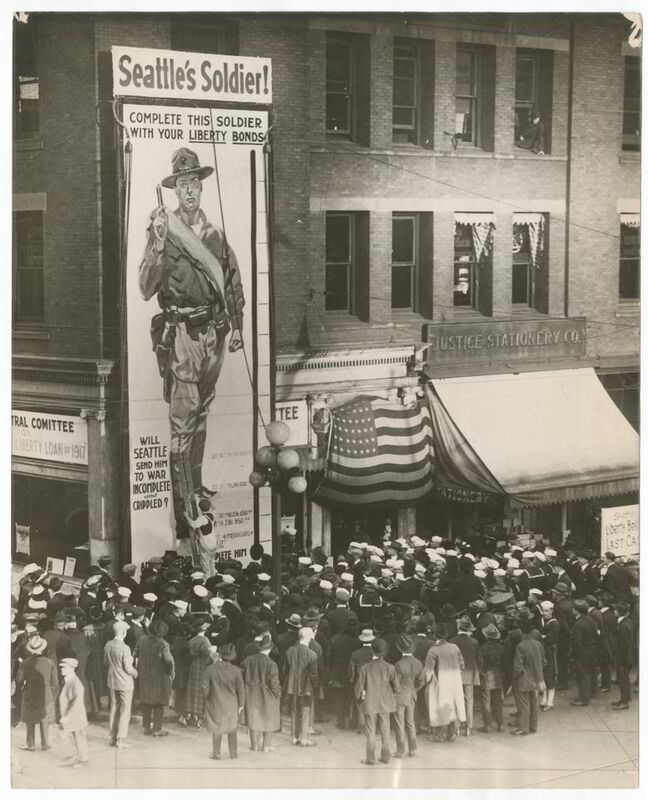 Peace on Seattle’s streets was achieved by careful organization: The Strike Committee enlisted the aid of 300 military veterans who served as a peacekeeping War Veterans Guard. And the intentional lack of large rallies, extensive pickets and other typical strike flashpoints provided few opportunities for conflict. 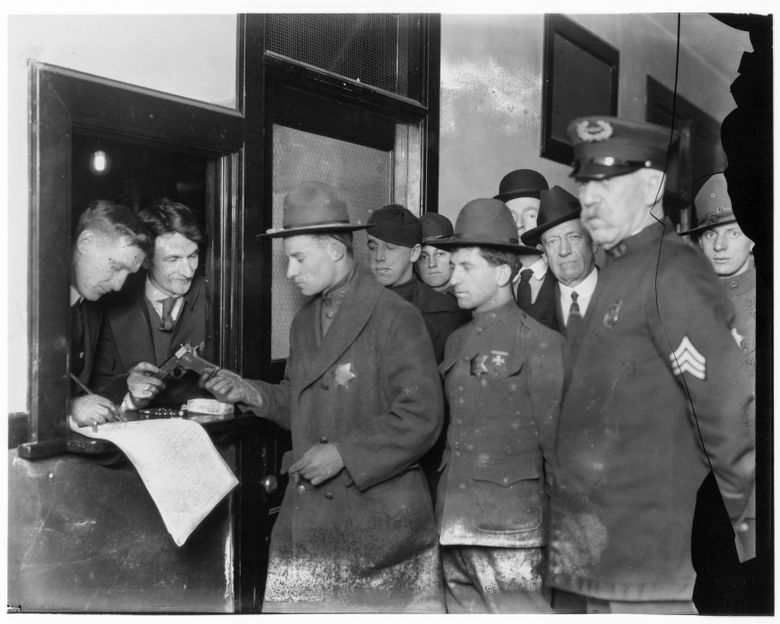 The result: Mayor Hanson’s amassed troops — he requested and got two U.S. Army battalions from Camp Lewis, recruited another 2,400 young militiamen (mostly from the University of Washington) and threatened to impose martial law — never left their stations at the local armory. The strike ended without the loss of a single life. 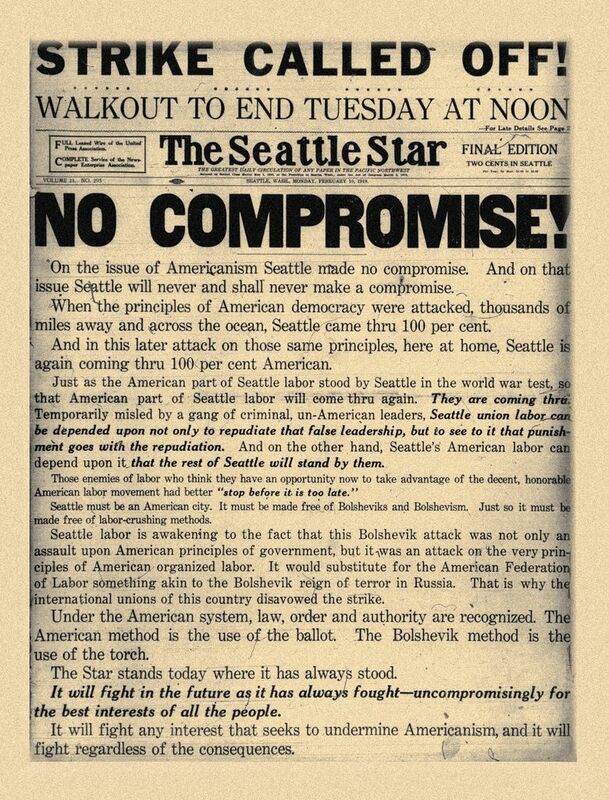 Myth: The defeat of the unions during the Seattle strike was a “disaster” and “glorious folly” for unions, leaving labor divided, vulnerable and impotent for at least a decade. Truth: Modern historians now object to this generalization. While it’s true that the strike didn’t achieve its stated goal, it also stood as a beacon of hope for many other global unions for many years. 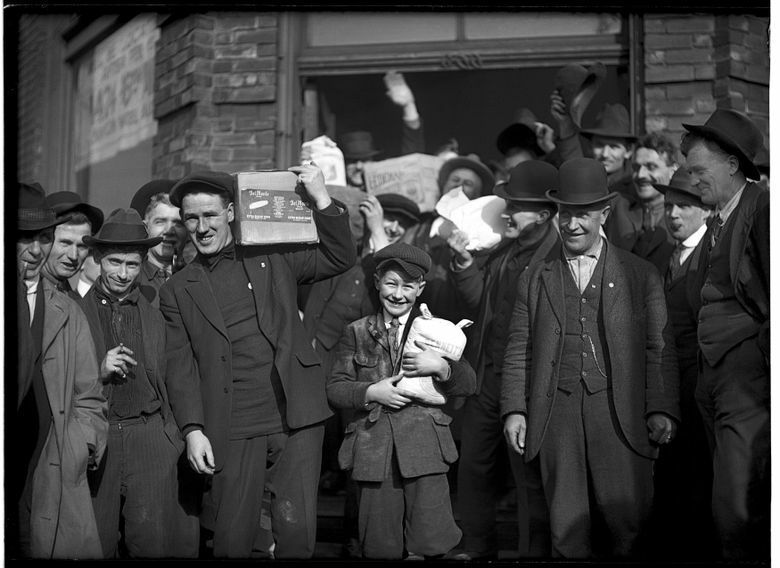 The months after the strike saw one of the greatest strike waves in U.S. history, with more than 4 million workers engaging in 3,630 separate strikes before 1920. Not all were successful, but many were inspired by Seattle’s walkout. 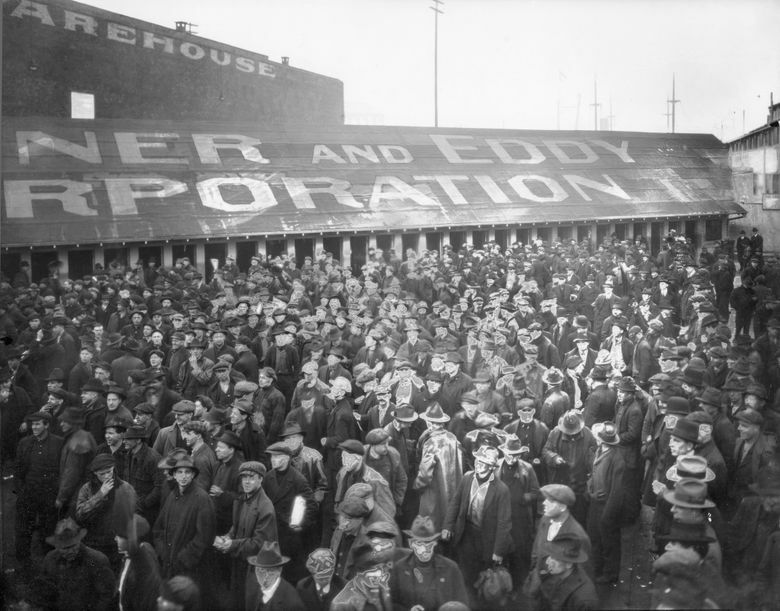 The notable decline in union power in the decade following the strike (for the next dozen years, unions were successfully beaten back by Republican rule, until a union resurgence in the 1930s) is largely attributable to a range of broader economic and political factors, not the Seattle General Strike, Gregory maintains. Myth: The strike went mostly unnoticed nationally because East Coast-centric media and power structures viewed Seattle as a frozen burg somewhere near Alaska. Truth: One of the great underrated legacies of the strike, Gregory believes, was the degree to which it put Seattle on the national map, firmly and forever more. Not, mind you, in a way local visitors bureau folks would like to see. 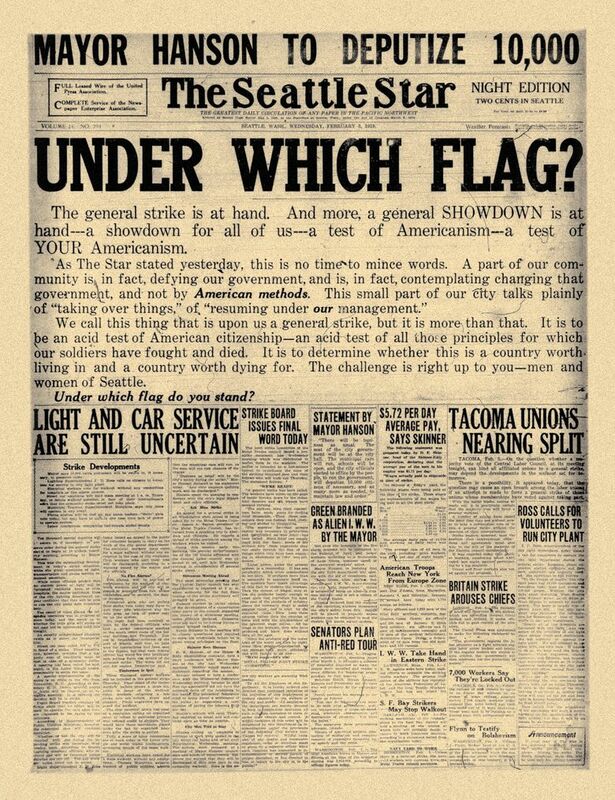 The New York Times’ front-page story about the onset of the strike alerted the world to “Revolution in Seattle.” But a modern analysis of the newspaper’s content backs up the notion that the strike put Seattle in The New York Times on a regular basis, and the city has held a more prominent place in American power circles since. 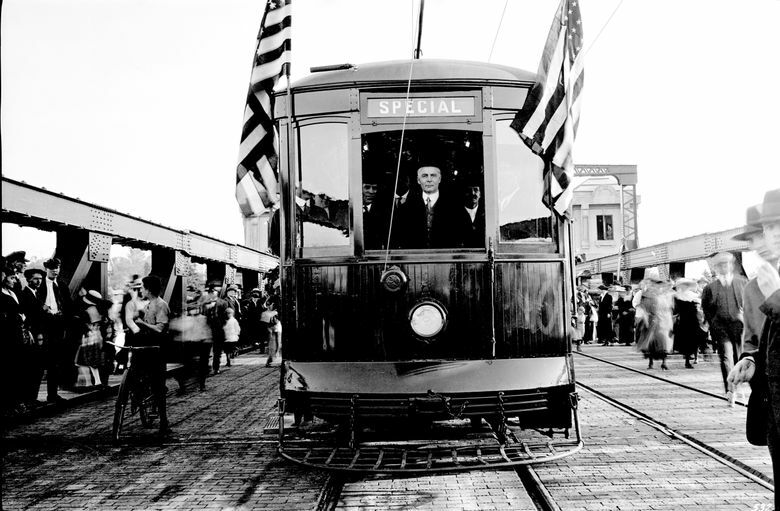 Myth: There’s little sign of the events of 1919 in day-to-day life in Seattle today. The strike remains, even a century hence, part of our foundational zeitgeist. Unknown numbers of newcomers arrive each year intrigued by the notion that a place that gave birth to something so fascinating, so quasi-revolutionary, must still have interesting stuff going on. For better or worse, we own it.